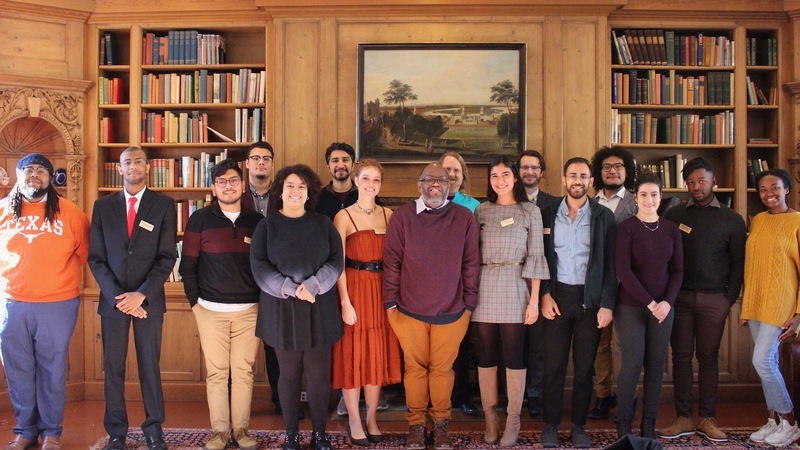 Ronald Kelly ’19, pictured second from right, attended the inaugural Mellon Mays Undergraduate Fellowship Conference on the Ancient World in November. Kelly’s Mellon Mays mentor, Tushar Irani, associate professor of philosophy and letters, is pictured second from the left in the back row. Also pictured is Bret Mulligan ’97, second from right in the back row. 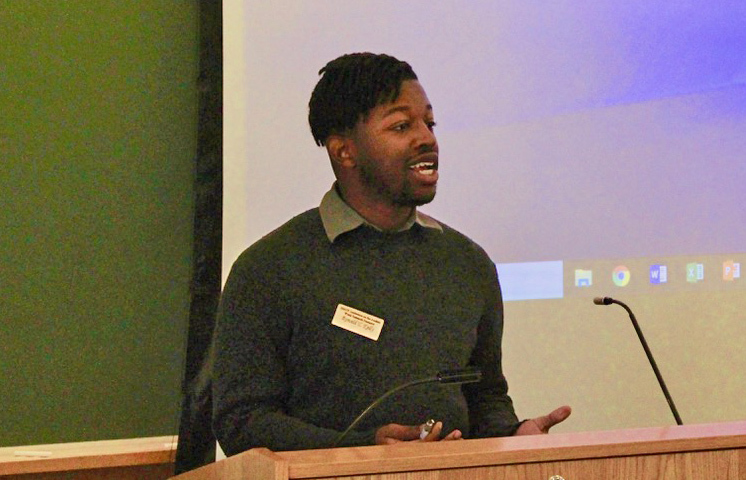 Ronald Kelly ’19, who is majoring in the College of Letters and classical studies, presented a paper at the first Mellon Mays Undergraduate Fellowship Conference on the Ancient World at Bryn Mawr College and Haverford College on Nov. 9–11. He attended the conference with his Mellon Mays mentor, Tushar Irani, associate professor of philosophy and letters. Kelly discussed what it meant to be foreign within the Roman Empire, focusing on aspects of immigration, integration, and myths of foreignness. The Mellon Mays Undergraduate Fellowship (MMUF) Program is the centerpiece of the Andrew W. Mellon Foundation’s initiatives to increase diversity in the faculty ranks of colleges and universities. The program operates from the foundational principle that encouraging a diverse range of scholarship and scholars in the academy is directly related to the betterment of career opportunities and life opportunities available to scholars, and by extension, to the country. Kelly discussed the research he has conducted as a Mellon Mays fellow on what it meant to be foreign within the Roman Empire, focusing on aspects of immigration, integration, and myths of foreignness found in the Satyricon, written by the 1st-century CE Roman novelist Petronius. “The conference offered an opportunity for Mellon Mays fellows to share with a wider community of scholars the research they are conducting. There were also activities tailored specifically to the fellows’ experiences and their aspirations to continue in academia,” Irani explained. The conference included a graduate school panel focusing on fields that deal with aspects of the ancient world and a discussion of support systems in place to assist students of color as they transition into graduate study. Dan-el Padilla Peralta, professor of classics at Princeton University, was the keynote speaker for the conference. Serendipitously, also at the event as a Mellon Mays faculty mentor was Bret Mulligan ’97, associate professor of classics at Haverford College, who—like Kelly—majored in the College of Letters and classical studies, at Wesleyan. “The conference provided a wonderful occasion for the two to discuss their shared experiences as Wesleyan students, even at a distance of over 20 years,” Irani said. The MMUF aims to prepare talented students to pursue university teaching careers in disciplines where minority faculty are notably underrepresented, and to prepare talented students who are committed to increasing cross-racial and ethnic understanding and interested in enabling others to better understand persons of different races and cultural backgrounds, as well as to address the attendant educational consequences of these disparities. The program serves the related goals of working to create campus environments that will be more conducive to improved racial and ethnic relations, and of providing diverse role models for all youth.